Are you experiencing an issue with wildlife in your area? If you have an urgent concern, please get in touch with us right away. If you are looking for more information, please click on one of the questions below to expand the content and find your answer. If you have any additional questions, please don’t hesitate to reach out to our team at DFW Wildlife Coalition. I found an injured or orphaned rabbit! If the rabbit is thought to be orphaned and is not injured proceed to FAQ’s “How Do I Know if the Baby Cottontail Needs to be Rescued”. Very often, cottontail babies are kidnapped. Cottontails are prey, the mother will not stay at the nest as this would draw predators to the babies. What should I do with the nest I found while mowing/cleaning my yard? A cottontail nest is typically a depression in the ground lined with fur. While it might seem that the nest you have found is abandoned, mother cottontail is almost certainly in the area. Cottontails are prey, and mothers do not stay with their young to avoid drawing predators to the nest. To determine if the mother is taking care of the babies, simply place a string, yarn, or dental floss in the shape of an X over the nest. Wait 12 hours; if the X has been disturbed, the mother has fed the babies. You may quickly peek and if the babies are content and sleeping, all is well. Gently recover the babies. It is a myth that mother cottontails will not accept her babies if you have touched them. She has invested time in her young and will care for them after your intervention. When monitoring a nest to determine if a mother is present, keep in mind that rabbits feed at dawn and dusk. When feeding, the mother rabbit will straddle the nest and the babies will eat 5-7% of their body weight. Keep all pets and children away from the cottontail nest. If dogs must go outside unleashed in the area in which a cottontail nest is present, depending on the breed of dog, a simple remedy is to turn a laundry basket upside down over the nest If necessary, a small brick may hold the basket in place; however, be sure to remove the laundry basket at dusk and leave it off until well after daybreak to allow the mother the opportunity to feed her babies. For a larger breed dog, position a wheelbarrow upside down to protect the nest, however be sure to position where the mother can slip under. Or remove from dusk to dawn to allow feeding. If the laundry basket or wheelbarrow won’t work with your dog, please keep your dog inside and on a leash when they need to potty. Cottontails open their eyes at around ten days old and become independent at approximately 3-4 weeks of age. Once they reach the size of a tennis ball or softball they are ready to be on their own. You may notice that newly independent cottontails will freeze in place. 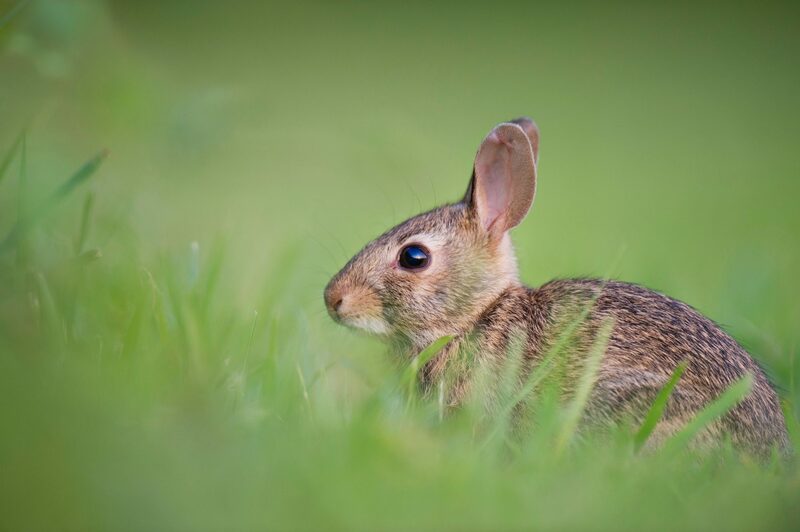 This is a defense mechanism; however, if your yard does not provide enough shelter and hiding spaces, this is a good time for you to collect and relocate the young cottontails to a safe location in your neighborhood, such as a local greenbelt that has plenty of undergrowth in which they can hide. This video by one of our local cottontail experts, Diana Leggett, Founder/President of WildRescue, illustrates that these babies are almost ready to leave the nest in about a week. How do I know if the baby cottontail needs to be rescued? The babies are restless and searching, appear thin like a candy bar instead of pear shape. Baby is cold to the touch. The nest has been disturbed and cannot be restored. The baby is smaller than a tennis ball. You know the mother is dead. There are fire ants or flies in the nest. Your dog or cat brought the baby cottontail to you. If any of these conditions are present, refer to our Quick Tips in the upper right corner of the website for further instructions. How do I know if the cottontail is old enough to be on its own? 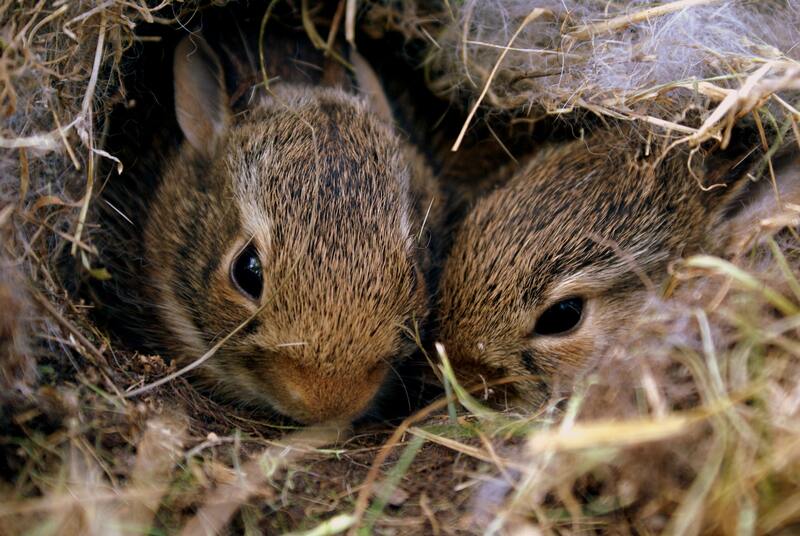 Once the baby cottontails emerge from the nest at 3-4 weeks of age, you may see them in your yard. Cottontails may freeze and blend with their surroundings. Their instincts may be telling them they cannot outrun the present danger/predator. 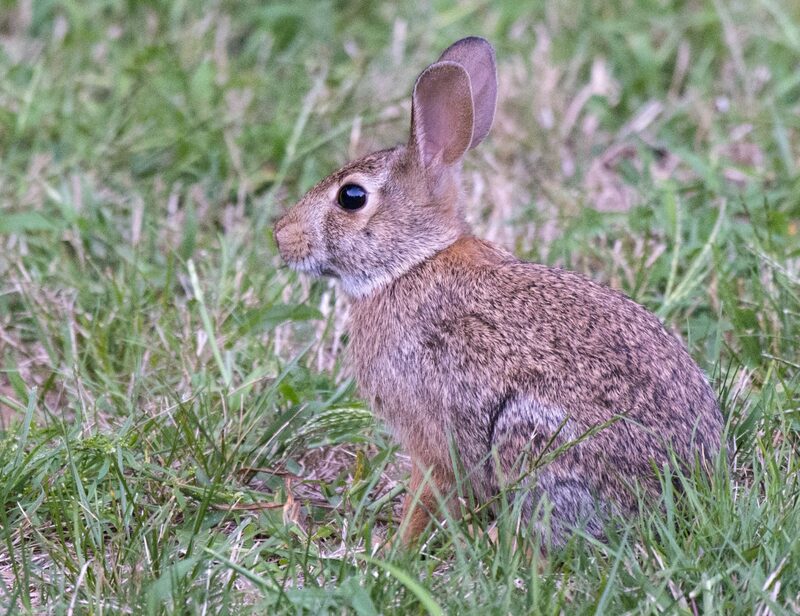 A juvenile cottontail will be the size of an average fist or a tennis ball. If you find a baby cottontail that has “frozen” in place and are unsure if it is okay. Place it in a lined with white paper towel small box. Place dandelion or other grass clippings from your yard in the box. DO NOT PUT CHEMICALLY TREATED PLANT MATERIAL IN THE BOX. Provide a small bottle cap of water and keep the bunny overnight. If in the morning the vegetation has been eaten. The rabbit has defecated small pellets. The cottontail is okay. You should release in your neighborhood, in an area with plenty of brush and ground cover for camouflage. If the cottontail did not eat or defecate overnight, the rabbit is not old enough to be on its own. Take the baby to a Cottontail wildlife rehabilitator as soon as possible. Refer to “Quick Tips” in the upper right of our website. What should I do with a nest in a very inconvenient location? Several times a year, we get calls with a cottontail nest at the base of a slide at a day care center or other similar perilous location. You cannot relocate a cottontail nest. The mother will not look for her nest that has been moved. Since mother only feeds at dusk and dawn when the school or daycare is closed both parties can share the space with a little help from you. Gently place the nest with babies in a box and store in a quite dark place during your business hours. Return nest with babies to the exact location prior to your departure or at dusk. Mother cottontail will visit the nest at dusk and dawn to feed her litter. If you are unsure if the mother is feeding the babies, you can verify by simply placing a string, yarn, or dental floss in the shape of an X over the nest each night. In the morning, look to see that the X has been disturbed and the babies are content and sleeping, all is well. Gently recover and place nest in the box for the day. Repeat each day until the rabbits are the size of a tennis ball or softball. Release rabbits at a location with brush and/or ground cover. Never play show and tell with the babies, as they can die from fear. By caring for the litter in this manner, you are saving lives! Cottontail babies are very difficult to rehab. Babies that are newborn, without fur on their tummies, have a higher risk of death. It is best for babies to be raised by their natural mother. Click here to learn more about conflict solutions with rabbits.